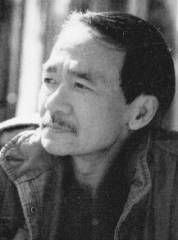 DU TU LE, pseudonym of Lê Cự Phách, born in 1942 in Ha Nam. The Geneva Accord in 1954 forced him to immigrate, with his brother, to South Vietnam, where he settled in Hoi An, Quang Nam, then later in Da Nang. Coming to Saigon in 1956, he pursued education at the high schools Tran Luc, Chu Van An, and the Saigon University Faculty of Letters. He joined the Army of the Republic of Vietnam (ARV), graduated as an officer from Thu Duc Military Academy, Course 13, and worked at the Psychological Warfare Department as a war correspondent and the managing editor of the ARV’s Tien Phong Magazine. In 1969, he was sent to a training seminar in basic journalism in Indianapolis City, Indiana. As a result of the 1975 events, he came to the US, and resettled in California in April 1975. Du Tu Le started composing and publishing poetry at an early age, in 1953, under many different pseudonyms. The pseudonym Du Tu Le was initially used for a poem published in Mai magazine in Saigon in 1958, and has since been the only pseudonym under his books. His poems has appeared in a number of Vietnamese-language literary magazines at home and abroad before and after 1975, and in the Los Angeles Times in 1983, the New York Times in 1996, the anthology World Poetry / An anthology of Verse From Antiquity To Our Time (New York: Norton) in 1998; also, his poems appeared in some universities’ textbooks since 1990, or used in some universities for education purpose. Jean-Claude-Pomonti, a leading writer for the Le Monde, had chosen one of his poems to translate into French, and had it published in La Rage D’Etre Vietnamien. Du Tử Lê was once mentioned by the late writer Mai Thao as one of the distinguished poets in the Vietnamese contemporary literature; the others are: Vu Hoang Chuong, Dinh Hung, Bui Giang, Nguyen Sa, Thanh Tam Tuyen, and To Thuy Yen. Du Tu Le is the author of more than 40 books. His eponymous debut collection of poems ‘Tho Du Tu Le’ was published in 1964, his most recent ‘[neu can,] hay cho bai thoú mot ten goi !? !’ published in 2006 by HT Productions. “The place where Mother returned” published in this issue is the fifth encomium taken from Du Tu Le’s ‘tributes to Mother on her way home via pacific ocean” translated by Thien Nhat Phuong and Tran Le Khanh, and published by HT Productions in 2002. Truong Khuc Me ve Bien Dong/ Tributes to Mother on her way home via Pacific Ocean (translated by Thien Nhat Phuong and Tran Le Khanh.. CA: HT Productions, 1st edition 1989, 2nd edition 2002). Copyright © 2006 The Writers Post. Nothing in this magazine may be downloaded, distributed, or reproduced without the permission of the author/ translator/ artist/ The Writers Post/ and Wordbridge magazine. Creating links to place The Writers Post or any of its pages within other framesets or in other documents is copyright violation, and is not permitted.